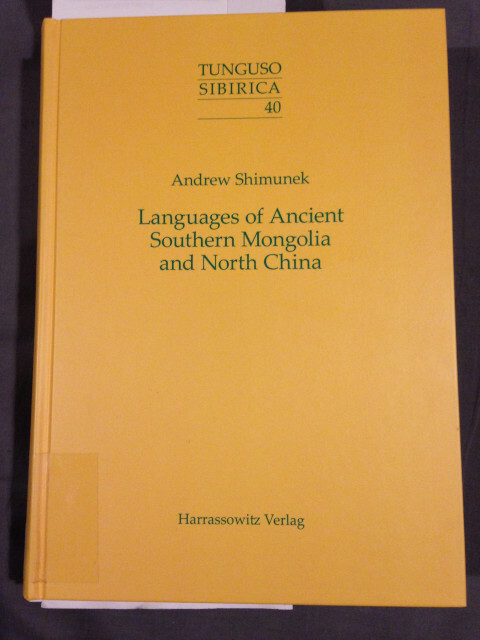 19.1.25.23:59: I HAVE SHIMUNEK'S BOOK! I'm running out of time tonight, so I just want to say one thing about the book. (If I had all the time in the world, I'd write a book about the book.) Since 2019 is the 900th anniversary of the Jurchen large script, I went to the index in search of the Jurchen script. Seven pages are listed (xxv, 99, 105-108, 362), but flipping through the book, I've seen more Jurchen than that. I should write a Jurchen index for the book which has no indexes for language names and subjects but not specific words. I'll post the index here when I'm done. 1.26.3:13: Of course I'd like to write other indexes for the book as well. 19.1.25.23:36: DO PYU AND PA-O SHARE A WORD FOR 'TO POUR'? One major difference - besides the fact that the Pyu writing styles involve only a single script - is that I presume both Khitan scripts provide more or less the same amount of phonological information in their non-logographic characters. That is not true of the two Pyu styles. The abbreviated style omits all subscript consonants representing codas²: e.g., in PYU 8, the one text mixing the styles³, 'to be named' appears as rmiṅ·⁴ on line 3 but as rmi without subscript ṅ· on line 4. (All lines of PYU 8 after 3 are in the abbreviated style.) Until Arlo Griffiths' recent identification of the subscript consonants, Pyu was thought to be an exclusively open syllable language like Tangut⁵. Arlo also identified the r- atop rmiṅ·. So until he came along, the word was thought to be /mi/. Now I interpret it as /r.miŋ/. If a Pyu text has no subscript consonants, it is most likely in the abbreviated style (though it is also possible that the text happened to have no closed syllables requiring subscript consonants⁶, particularly if it is very short). The word cha 'to pour' appears in PYU 7.18 and 8.18. (PYU 7 is nearly identical to 8; one major difference is that PYU 7 is completely in the abbreviated style.) If the word had only appeared here, it would not be possible to determine if cha had a coda or not. However, there is a word chai 'to pour' in PYU 7.22 and 8.23. Scholars disagree on whether cha and chai mean the same thing. I belong to the school of thought that regards them as semantically identical. I go further and also regard them as phonemically identical: two different abbreviations of a hypothetical full spelling for /cʰaj/. If I am correct, then /cʰaj/ cannot be compared to Written Burmese ဆမ်း chamḥ 'to pour on food'; the codas cannot be reconciled. But could /cʰaj/ be compared to Pa-O chjā 'to pour' which I found in Solnit's 1989 wordlist today? Pa-O is a Karenic language, and both Katō (2005) and Krech (2012) have proposed that Pyu is Karenic. So this is not a case of me finding a potential cognate in some random Sino-Tibetan language far from Pyu. If the distribution of Karenic languages in the past were like their distribution today, Pyu may have had Karenic neighbors. Or should I say relatives? For now I continue to regard Pyu as an isolate within Sino-Tibetan - the family's equivalent of Albanian - or if an equlaly extinct parallel is desired, Tocharian. However, that doesn't mean I am not on the lookout for any lexical parallels which could be inherited or borrowed. ¹1.26.1:11: All known molded tablets are in the abbreviated style. I have suggested that the abbreviated style was used due to the small amount of space on the tablets. However, there are also inscriptions with the abbreviated style despite ample space for the full style (e.g., PYU 2-6). And there are inscriptions in the full style squeezed onto small surfaces (e.g., the bottom edge of PYU 24). So space was not always a factor in the choice of style. ²1.26.2:00: All subscript consonants represent the codas, but the reverse may not have been true if the nonsubscript character -ḥ represented a glottal coda /h/ (or /ʔ/?). I also think ḥ indicated the voicelessness of sonorant codas: e.g., the honorific ḅay·ṁḥ was /ɓäj̊/ (and was abbreviated as ḅaṁḥ with the ḥ indicating a voiceless but unwritten /j/). ³1.26.1:11: On the other hand, the two Khitan scripts are never mixed. ⁴The middle dot indicates that the preceding consonant letter is written as a subscript character. ⁵My Tangut notation does not make this clear since I use -n, -q, -r, and -' after vowels to indicate nasalization, tenseness, retroflexion, and an unknown quality of vowels that are not followed by codas. ⁶1.26.2:06: In other words, the only closed syllables in the text were those ending in ḥ /h/ and in voiceless sonorants (whose voicelessness was written as ḥ). If ḥ turns out to have been a marker of phonation or tone, then the text would only have open syllables. ⁷1.26.2:13: Katō (2005: 5) proposes that cha 'to pour' is cognate to Eastern Pwo chè, Western Pwo sheʔ, and Sgaw chɛ̄ʔ, all in the H3 (*high stopped) tone category. I don't think any of those Karenic forms are cognate to cha because I would expect a Proto-Karenic final stop to correspond to a Pyu final stop or /h/ (which might have really been /ʔ/). 19.1.24.23:59: DOES PYU ṄA 'TO SPEAK' HAVE A TANGUT COGNATE? Today I realized that Pyu ṅa /ŋa(C)/, a verb of saying (PYU 7.14, 8.14) might be cognate to Written Tibetan ngag 'speech' and Old Chinese 語 *ŋ(r)aʔ 'to speak' and 言 *ŋa[n] 'speech'. Might ṅa also be cognate to the Tangut ngwu'-word family? One problem is the vowel. Tangut -u'1 is either from pre-Tangut *-oX or *-əX¹. The late EG Pulleyblank might suggest *a/*ə-ablaut: Pyu, Tibetan, and Chinese had *a whereas pre-Tangut had *ə. Perhaps comparative work with closer relatives of Tangut will point to one vowel or the other. ¹1.25.0:52: -' represents an unknown Tangut phonetic quality and *-X represents its equally unknown pre-Tangut source. ²1.25.1:05: The vowel of 'five' irregularly changed to match that of the adjacent numeral 𗥃 1lyr'3 'four', presumably at a stage when 'four' was something like *R-ly' before *R- conditioned a retroflex vowel and was lost. If not for that change, 'five' would have been †1ngwi1. as a Jurchen single-character spelling for the Jurchen name of 金世宗 Emperor Shizong (r. 1161-1189) which is only known to me as a Chinese transcription 烏祿 *u lu. I don't know of any other single-character candidates for the spelling, so I'm going to move on to potential parts of a two-character spelling. Why would Jurchen need five u when it could have done with one? Maybe because it didn't have just one? If Jin Jurchen had a /ʊ/ : /u/ distinction and a vowel length distinction, then four of the five could stand for /ʊ ʊː u uː/. And the fifth might not have stood for u in the Jin dynasty; it might have been a logogram for a word beginning with u- that was later spelled with it plus one or more phonograms, leading to its reanalysis as an u-character. Another possibility is that the Jurchen script inherited a set of characters from the Parhae script that somehow made more sense for the language it originally represented but became redundant for Jurchen. I'll keep those scenarios in mind as I examine the u-characters in depth from part 5 onward. This year is the 900th anniversary of the Jurchen large script. Intersect the two, and you get me writing gurun ni ngala herge inenggi, my attempt to translate 'national handwriting day' in Jurchen. herge shape, possibly script like Manchu hergen? I'd like to comment on those eight graphs, but I'm out of time, and I want to get back to the Emperor Shizong series tomorrow. And I still have to write the later parts of "The Jurchen Script: Innovation or Derivation?". The -ri of halmari may be a noun suffix of unknown function. See Gorelova (2000: 114) for other examples of -ri. The Bureau of Translators vocabulary dialect may have preserved the bare stem halma without a suffix. See Kane (1989: 116) for other instances of zero in this dialect corresponding to Manchu -ri. only appears at the ends of the aforementioned two words, 'sword' and 'strong'. If it were simply read ma, it should be more common as a phonogram. Could it have represented maa with a long vowel or even mar? Kane (1989: 130) noted that Jurchen syllable-final-r was sometimes omitted in Chinese transcription but does not give any word-final examples. Could that character (for mar?) be derived from the Chinese character 犮 which would have been read as *pɦar in northern Late Middle Chinese? the a-word <? ma(a/r? )> 'strong' and the e-word <fushe den> 'prosperous'. must correspond to 兀魯 *u lu. Or so Kiyose and Jin thought; both glossed it as 'strong' (which then raises the question of what the -ma after it was). Compare the shape of <STRONG> to the right side 𧈧 of the Chinese character 強 'strong'. I think the first characters of those words were originally standalone logograms. Those Ming spellings have a final phonogram that might not have been present when the script was originally developed in the early 12th century. If the final phonogram was <lma>, then my attempt to link it to 犮 *pɦar will have to be abandoned. It's also possible that <STRONG> is functioning as a phonogram for ulu or uru in that name. The character may give connotations of 'strong', but ulu or uru by itself may not mean 'strong'; that disyllable could be an unrelated partial homophone of 'strong'. Even if <STRONG> in that name was ulu or uru, that still doesn't mean that was the name of 金世宗 Emperor Shizong (r. 1161-1189) - the character reading could have had l whereas the emperor's name could have had r - or vice versa. As we will see in the next parts, the Jurchen script has multiple characters for what seem to be u- and lu-syllables from a Ming Jurchen perspective. Such apparent redundancy may reflect Jin Jurchen distinctions between /ʊ/ and /u/ on the one hand and /lʊ/ and /lu/ on the other. But does the evidence support that hypothesis? We shall see. Problem solved? No, not quite. In part 1 I already mentioned the problem of whether 烏祿 *u lu, the Chinese transcription of Emperor Shizong's name, represented Jurchen Ulu or Uru. How do we know that his name was Uru and not Ulu? We don't. Let's look at how that character's reading was reconstructed. and transcribed into Ming Mandarin as 兀魯麻弗塞登 *u lu ma fu sə təŋ (#761). There is no word spacing in the Jurchen script. How did Kiyose and Jin decide where to make a break between 'strong' and 'prosperous'? My guess is vowel harmony. Normally in Jurchen, a and e do not coexist within a root. must have sounded like 登 *təŋ: i.e., it was den [təɴ] in the transcription system I use on this site. must have sounded like 弗塞/伏塞 *fu sə: i.e., it was fushe [fusxə] in the transcription system I use on this site. Fushe and den are in vocalic harmony (no a to conflict with e in either reading) and are likely to have been part of the same word. But was fusheden by itself 'prosperous', or did the second character represent one or more syllables at the beginning of 'prosperous'? (We can assume that at least the first character represented the Jurchen word for 'strong'.) Kiyose and Jin give away the answer above. However, if you want to learn the probable logic behind their answer, watch for part 3. Further details are at Wikipedia. Again, further details are at Wikipedia. Emperor Shizong's successor 金章宗 Emperor Zhangzong (r. 1189-1208) abolished the Khitan scripts. But back to Jurchen - I've been wondering what Emperor Shizong's name was in the Jurchen script. The History of the Jin Dynasty (Basic Annals 5 and 6) presents it as 烏祿 *ulu in the Chinese script. Chinese transcriptions of Jurchen do not differentiate between Jurchen l and r since Jin Chinese had no *r. So his name could have been Ulu or Uru in Jurchen. The ambiguities do not stop there. In theory there are many ways to spell both Ulu and Uru in the Jurchen script. I'll be examining the possibilities in the following parts: 2, 3, 4, 5 (link to be added).